Elicia joined MacArthur, Heder & Metler in 2014 as an associate attorney and focuses her practice on family law. She graduated from the J. Reuben Clark Law School at Brigham Young University and is an active member of the Utah State Bar. 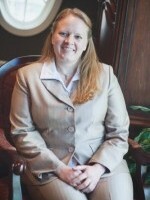 Prior to joining MHM, Elicia worked up in Layton, Utah at LeBaron & Jensen, working with a variety of litigation cases. During her first summer in law school, Elicia enjoyed serving as a legal intern in Sandton, South Africa for DLA Cliffe Dekker Hofmeyr on employment law matters and then in Provo, Utah for Scribner & McCandless on divorce and custody matters. During her second summer, she worked for the Department of Defense in the Judge Advocate General’s office at Davis-Monthan Air Force Base in Tucson, Arizona (hoo-rah!) dealing primarily with criminal prosecution, wills, and legal reviews of day-to-day base functioning. In addition to course work in law school, Elicia was highly involved in a number of professional, service-oriented, and extracurricular pursuits. Ms. Hansen was a Managing Editor of Submissions and associate editor for the International Law and Management Review journal and participated on the Moot Court team. She volunteered with the Utah County Family Justice Center Legal Clinic, the BYU Jail Outreach Program, the BYU Law School 5th Grade Mentoring Program, and the Utah Family Law Review and Reform Project. Elicia was elected president of the BYU Family Law Society for the 2010-2011 school year and was awarded aUtah Bar Family Law Section Scholarship in 2011. The law school twice awarded her with aFaculty Award for Meritorious Contribution and Distinguished Service, both in 2010 and 2011, and the Distinguished Clinical Practice Award in 2011. Prior to law school, Elicia’s undergraduate degree in family sciences afforded a number of internship and growth opportunities, including working on Flourishing Families, A National Study of Family Life, as historian and interviewer in both Seattle, WA and Orem, UT. Other undergraduate areas of research included prevention of adolescent obesity, genogram coding and analysis, prison reentry programs, and real estate investment trust mutual funds. She has now combined her family science experience and legal expertise in maintaining an active practice. Outside of the law, Elicia loves music, running, biking, racquetball, and just about any other sport. Most of all, she loves spending time with her family, especially her wonderful nieces and nephews.